Funnel cakes are incredibly popular concession treats! IMPORTANT ELECTRICAL REQUIREMENTS!!! 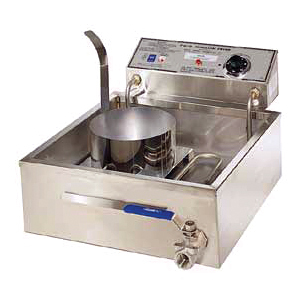 - Our funnel cake fryer is a 220 Volt machine, requiring 15Amps service, 4400 Watts. We provide a 220 RECEPTACLE but an electrician will be required to wire the receptacle to the electrical service. 110 Volt units are not available for rental. Click HERE for more information. 1. In a large bucket, mix 20 ounces of water with every pound of mix. Worry more about mix consistency than these exact measurements. The mix should have no lumps and flow smoothly and quickly through the funnel cake pitcher but not be runny. A wire whisk is excellent for mixing. As time passes, the water will evaporate from the mix and more water will have to be added to keep the proper consistency. 2. Place the flat metal platform on the elements, your ring will rest on this platform. 3. Add peanut oil to the “oil level” line in the fryer and turn the thermostat knob to 375 degrees. Allow the fryer to cycle one time and you are ready to fry! 4. Fill the funnel cake pitcher with mix. Place your 8” funnel cake ring in the fryer atop the platform. Pour batter into mold from funnel pitcher, starting with a circle of batter near outer edge of mold, then making zig-zag overlapping design into outer edge circle of batter you started with. Do not fill mold once batter expands as it cooks. 5. As soon as the edges brown, (almost immediately) you can lift the ring off of the cake and allow it to float in the open area of the fryer, so you can use the ring to make another funnel cake. Flip the cake in about 30 seconds. 6. When your funnel cake is golden brown, remove it with tongs and let the excess grease drip back into the fryer, then place it on a paper plate or under a heatlamp. 7. Add powdered sugar with a sifter and serve! TIPS: 1. Just because there is space in the fryer to cook another funnel cake doesn’t mean that there is sufficient heat to cook another! You have to maintain 375 degrees in the fryer or the funnel cakes soak up the grease and are not edible. 2. Try not to hold funnel cakes out of the grease longer than 5 minutes, they are very perishable. 1.Allow oil to cool before draining! 3. Wash the pitcher and all tools with hot water. 4. Remember to return all tools with your rental!